By name, a learning management system (LMS) is content-driven. It is a site designed to be your members’ and clients’ one-stop shop to access your full array of educational content and collaborative material. Thus, in conceptualizing an LMS, commonly a great deal of time is spent organizing and developing content, while other attributes of the site become more of an afterthought. This can often be the case with the site’s visual concepts and design. While design plays a more passive role in an LMS, the majority of us have had experiences where a site’s design can cause us to be immediately attracted to, or turned off by, the site upon arriving on the home page. Site design shapes the entire user experience – from whether the user feels welcomed on the site, to the ease of access and navigation. Additionally, in our technology-heavy lives, we have become used to viewing the quality of a website as representative of the credibility and professional-ness of an organization. So while the design is an aspect that literally falls in the background of an LMS, it is also an element that should not be overlooked. Like many associations, AFTA’s design concepts began with its association webpage. “We wanted our materials to look the same across all offerings,” Kimberley explained. Therefore, AFTA’s Elevate page is designed to mirror many of the details from its main website including fonts and color schemes, backgrounds, and menu offerings. In this way, users experience a seamless transition from AFTA’s main website to its Elevate page, and are also able to easily recognize that they are working with an AFTA product. While AFTA’s website served as a blueprint for its Elevate design concept, AFTA also wanted to ensure its design elements worked well in an LMS format, as Kimberley explained, “we wanted to make sure it had a strong relationship to our main website but could still take full advantage of all the LMS functionality we’d have with Elevate.” Here, AFTA drew inspiration from CommPartners’ Elevate site for some cues on building a structure specific to an LMS. AFTA also sought to place itself in the mindset of a user coming to the site, and thought about what design elements could make a user’s experience easier and more pleasant. For example, AFTA developed ‘user-friendly icons’ based around content type and subject, which it created to visually stand out with bright colors. These help users easily navigate from page to page and quickly find relevant learning content. As Kimberly explained, AFTA sought to use its Elevate site to highlight its role as part of the creative industry in communicating the value of art. 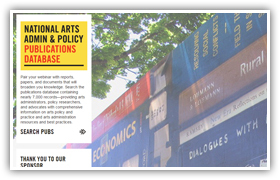 In a unique approach, AFTA accomplished this by incorporating public art recognized by its Public Art Network Year in Review Project into its main website and Elevate platform as the background images for its webpages. For interested individuals, the background images are linked to more information about each piece of art. Appropriately, for the background of its Elevate site, AFTA chose a public mural entitled “The Knowledge” installed on the campus of Portland State University. While AFTA incorporated bold colors and artistic design into its Elevate page, it was also important to not lose sight of the fact that the Elevate site is a business tool. As such, in addition to conceptualizing a creative design, AFTA also stressed the importance of organization and flow as the building blocks for the site. In this way, AFTA’s Elevate site is able to portray life and art, while at the same time remaining an effective tool for its members to collaborate and learn. If you’d like more information on LMS design or would like a consultation about designing your Elevate LMS platform site, please reach out to us at efinstein@commpartners.com.